James Oberstar: Former U.S. congressman for Minnesota's 8th District, former chairman of the Transportation and Infrastructure Committee, current senior adviser for transportation and infrastructure practice at National Strategies Inc.
Five years ago, the I-35W bridge over the Mississippi River in Minneapolis collapsed, killing 13 people and injuring more than 100 others. The disaster led many lawmakers, including Jim Oberstar, who at that time chaired the House Transportation Committee, to call for increased funding to improve the country's crumbling infrastructure. Oberstar, a Democrat who represented Minnesota's 8th Congressional District until 2010, proposed a five-cents-a-gallon increase in the federal gas tax in 2007, which could finance repairs on 6,175 structurally deficient bridges in the United States. That proposal never became law. "We would've made a dent on the most critical structures in the nation's bridge inventory, and those that carry most of the commerce and much of the auto traffic between states, over bodies of water and over railroad structures," Oberstar said on The Daily Circuit Wednesday. Jeff in Minneapolis said he thinks the "no new taxes" pledges many politicians take when they come into office holds back funding of infrastructure upkeep in the country. "I would be more than happy to pay an extra federal gas tax in order to keep road and bridges safe and functioning," he said. Oberstar said preventing additional funding through taxes will hold back the nation's economic growth. "It's both sides of the aisle; it's this fear of investing in the fundamentals of our economy," he said. In Minnesota, officials identified 136 structurally deficient bridges. 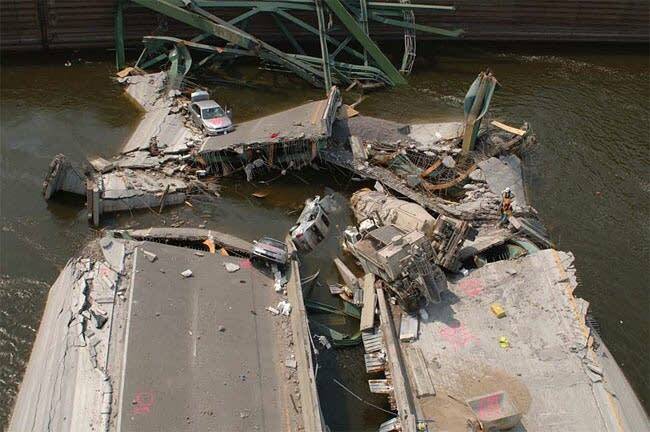 The state is planning to repair or replace all of those bridges by 2018 with a $2.5 billion program passed by the Legislature after the 35W bridge collapse. Nationwide, the system we invested in more than 50 years ago won't survive without more money, said Jack Basso, director of program finance and management with the American Association of State Highway and Transportation Officials. "At this point in time we have the opportunity to move forward, but we have a huge funding gap between what is available for infrastructure programs and what we need across the country," he said on The Daily Circuit. Overall, 1 in 9 bridges is structurally deficient. The average age of U.S. bridges is 42 years, and most are designed to last 50 years. David Goldberg, communications director for Transportation 4 America, also joined the discussion. He said that in addition to fixing the roads and structures we already have, urban areas need to invest in alternative forms of transportation to ease congestion on roads. "Those things are missing elements from our system, but we're not addressing those in any meaningful way whatsoever," he said. How should we pay for infrastructure repairs? Comment on the blog.